Bruce mason centre in Takapuna is buzzing. Lots of people: old, young, families, couples, all sorts. 450 of them. All very excited. As am I! And no this is not for a concert, or a comedy night. We are all here because we want to be and will be NZ citizens after tonight’s ceremony. I am going to be a real kiwi!! After living here for 9 years and feeling more and more passionate about this beautiful country, I thought it was time to show my true allegiance. So the final stage tonight is standing up, reading the allegiance together with all those others from so many different parts of the world. And we all want to live in NZ. And singing the National Anthem for the first time as citizens. Wow, I really wasn’t expecting the emotion. Almost every second sentence I just had to stop. To stop the trembling. And to understand what the words really meant. ‘ At thy feet’ .. ? Very special. 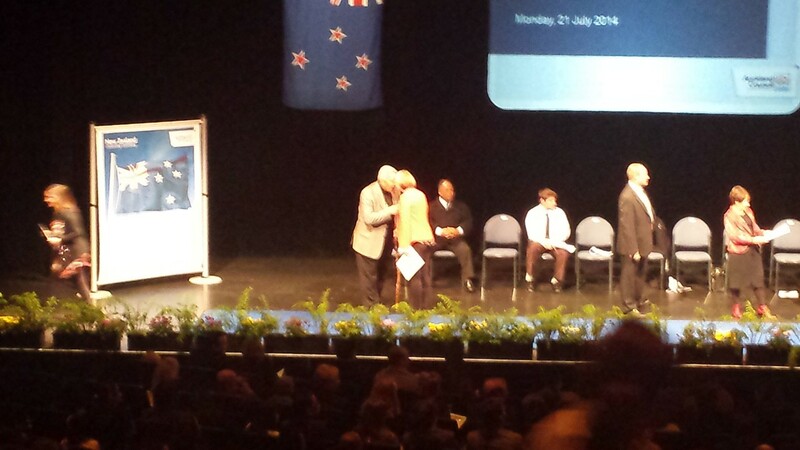 I am looking forward to my kiwi future, to contributing to the future of NZ. This entry was posted in nz general and tagged citizenship, kiwi, nz, orange. Bookmark the permalink.